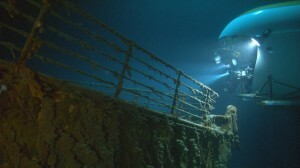 Official owners of the Titanic shipwreck by the name of RMS Titanic Inc. are planning a possible expedition back to the legendary shipwreck in 2010. 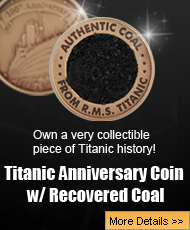 The company is currently undergoing court hearings to ensure that the salvage would preserve the legendary Titanic shipwreck for public as well as being a lucrative salvage for RMS Titanic Inc. This expedition would mark the first one since 2004 (one of the previous include an expedition for the 1997 Titanic movie). U.S. District Judge Rebecca Beach Smith, a maritime jurist who considers the wreck an “international treasure,” is presiding over the hearings. They are not only intended to determine a salvage award, but to establish legal guarantees that thousands of Titanic artifacts remain intact as a collection and forever accessible to the public. Some pieces have ended up in London auction houses. Over 5,900 pieces of china ship fittings and personal belongings are valued at over $110 million and are displayed by Premier Exhibitions Inc.; a subsidiary of RMS Titanic Inc.
Deep-dive explorer Paul-Henry Nargeolet, who has led five expeditions to the Titanic wreck spoke to the dangers of deep sea exploration including icebergs that can destroy dive ships, claustrophobic voyages 12,000-feet down to the wreck through 33-degree Atlantic waters. After being discovered in 1985 by Dr. Robert Ballard, the Titanic wreck has been undergoing court claims as to the ownership of the wreckage. Courts have declared that RMS Titanic Inc. has exclusive rights to salvage the Titanic. At the hearings this week in Norfolk, lawyers for RMS Titanic will seek title to the artifacts and a monetary award for its salvage costs. Judge Smith has called upon the government to assemble the Titanic artifacts as a collection available to the public. Smith is mindful of the historic importance of the Titanic and the 1,522 lost in the tragedy based on her previous rulings and statements from the bench. If the court agrees to RMS Titanic’s request, the company could sell the entire collection to a museum with court approval. The company has said it has no plans to do so. A citizen by the name of Douglas Faulkner Woolley has also challenged the case and is planning his own expedition. So the question still remains: who owns the Titanic shipwreck, one of the largest collection of historic Titanic artifacts buried 2.4 miles below the surface of the Atlantic.